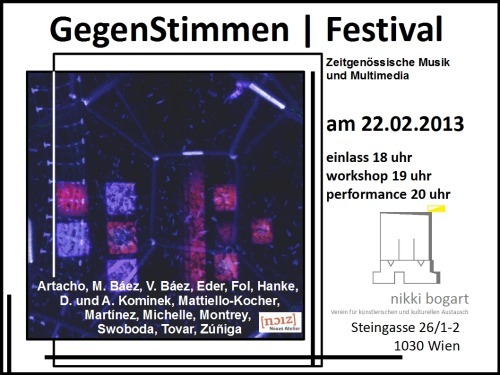 The GegenStimmen Festival, which showcases new works in an audiovisiual context, will take place on Friday, February 22, 2013 at Nikki Bogart, Steingasse 26 (1030 Vienna). Admission is free in order to keep the arts, specifically innovative new works, accessible. 8pm: performance | musical works by Artacho, V. Baez, Eder, Fol, Hanke, Mattiello/Kocher, Montrey, Tovar | visuals by Kominek, M. Baez, Martinez, and others.